Four colourful and linking geomorphic game boards with evocative 'winter themed' art. ATS TT rules of play. 12 scenarios covering myriad actions. ATS TT large marker counters. 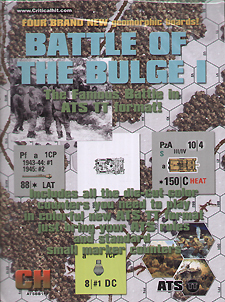 ATS TT Battle of the Bulge combat counters needed to play the scenarios (560 colour die-cut counters [2x148 pc. sheet] plus 88 BRAND NEW ATS TT large marker counters plus ATS TT Bulge vehicles/guns [2x88 pc. sheet]). These counters are also used in ATS TT Darkest December.